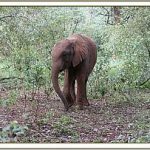 I adopted little Mbegu last October when I went to visit the Shelrick Elephant orphanage, in Naroibi, Kenya. I received an email report each month about her progress. This month I was so delighted to receive this one.